CHATSWORTH, CA - Image Entertainment, Inc. and One Village Entertainment are proud to announce the release of The Last Fall , which will be available on DVD and digital download on January 15, 2013 at an SRP of $27.97. 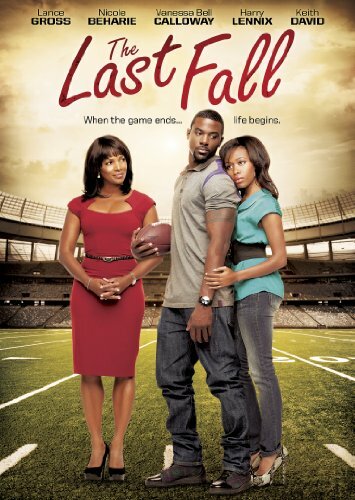 Starring Lance Gross ("Meet the Browns") and directed by former pro-football player Matthew A. Cherry, The Last Fall takes a close look at the rough and tumble world of professional football, and its effect on affairs of the heart. The film will also world premiere on BET, coinciding with the home video release date. Pre order date is December 18, 2012. Kyle Bishop (Lance Gross) dreamt of a life of luxury and the means to take care of his family when he joined the NFL. But, life took an unexpected turn, bringing Kyle back to his hometown. In high school, Kyle's major focus was his one true love, Faith (Nicole Beharie, Shame, American Violet), but his dedication to the NFL left her and their relationship behind. Now, caught between the demands of the career he's always dreamed of and the single mother who holds his heart, Kyle must make the most important decision of his life. In addition to Lance Gross and Nicole Beharie, The Last Fall all-star cast includes Vanessa Bell Calloway (Coming to America, Cheaper by the Dozen), Darrin Dewitt Henson (Stomp the Yard), Keith David (Platoon, Crash) and Harry Lennix (Ray, The Matrix Revolution). RLJ Entertainment, Inc. (NASDAQ: RLJE) is a premier independent licensee and distributor of entertainment content and programming in North America, the United Kingdom and Australia with over 5,200 exclusive titles. RLJE is a leader in numerous genres via its owned and distributed brands such as Acorn (British TV), Image (stand-up comedy, feature films), One Village (urban), Acacia (fitness), Slingshot (faith), Athena (educational), Criterion (art films) and Madacy (gift sets). These titles are distributed in multiple formats including DVD, Blu-ray(TM), digital download, digital streaming, broadcast television (including satellite and cable), theatrical and non-theatrical. Via its majority-owned subsidiary Agatha Christie Limited, RLJE controls the intellectual property and publishing rights to some of the greatest works of mystery fiction , including stories of the iconic sleuths Miss Marple and Poirot. And through its direct-to-consumer business, RLJE has direct contacts and billings relationships with millions of consumers. RLJE leverages its management experience to acquire, distribute, and monetize existing and original content for its many distribution channels, including its branded digital subscription channels, and engages a distinct audience with programming that appeals directly to their unique viewing interests. RLJE has proprietary e-commerce web sites for the Acorn and Acacia brands, and owns the recently launched Acorn TV digital subscription service.